The Curious Wavefunction: Peter Thiel on biotechnology again: "Get rid of the randomness"
Peter Thiel on biotechnology again: "Get rid of the randomness"
Peter Thiel has some provocative thoughts on biotechnology again, this time in an interview for Technology Review. I had a post earlier about Thiel's view of biotechnology which included some hardheaded, sensible thoughts and some more questionable skepticism. This interview projects a similar combination. 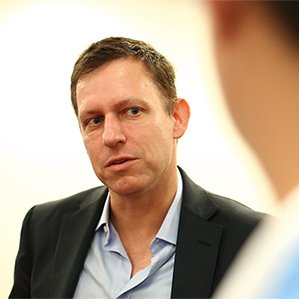 The interview is really about Thiel's investment in Stemcentrx, a company utilizing our increasing knowledge of stem cell driven tumor evolution to create targeted therapy. As Derek noted in his post on the company it's an interesting approach but there's still a lot of holes that need to be plugged before it becomes reliable. Thiel's own take on the company is unsurprisingly positive, although it's not clear why he thinks the company's approach makes it particularly Thiel-worthy (he is known to be very judicious when it comes to funding startups). He seems to think that Stemcentrx's use of human xenografts in mice is something "very unusual", but I find Thiel's take on this quite unusual since drug discovery scientists have been using human xenografts in mice for decades so it's certainly not a novel idea. Also as Derek says in his post, just because a drug works in human xenografts does not mean it will work in humans. "It’s interesting that a lot of technology outfits are getting into biology. Google has announced a number of plans. You have invested in longevity research. What do you think makes actual programmers want to start programming biology?" “The big picture is the question of whether biological science can be transformed into an information science. Can something that seems chaotic, fractal, and generally random be transformed into something more deterministic and more controlled? There are a couple of thoughts I have on this. Firstly, biological science has been increasingly transformed into information science for about fifty years now so that's not a brand new development. The problem is that just because it's information science does not mean it's deterministic; Thiel of all people should know how messy, incomplete and random information can be, and unlike him I certainly don’t see randomness as an “evil” (Darwinian evolution, anyone?). And even when the information is available it can be pretty hard to get a handle on it. People who do cheminformatics or bioinformatics for instance are well aware of the kind of false and messy correlations they can find even in information-rich datasets. There is no doubt that we can make headway into this problem with better algorithms and computing power, but to believe that somehow injecting enough programmers into biology will enable a quantum leap on the information analysis problem strikes me as a bit naive. Consider Thiel's thoughts on aging: aging is indeed a result of many imperceptible and perceptible random events. But the issue in addressing aging is not the lack of adequate computing approaches that would transform the randomness into predictability. It's the ignorance in understanding the randomness that shackles our ability to understand it in the first place. A good analogy is provided by the random molecules of water molecules in a beaker. We know the movement is random, but we also know enough about this randomness to use the laws of quantum mechanics and statistical thermodynamics to provide accurate and predictable macroscopic descriptions of the random motion. Unlike this scenario, we don't have a complete picture of the randomness in aging (or in cancer for that matter) and we don't know what causes the randomness in the first place. The problem is not one of technology as Thiel seems to think, it's one of basic understanding. It's one of simple ignorance. The other peeve I have with thoughts like this is the implicit belief that somehow before the advent of programmers all the scientists working in biotechnology and drug discovery did not have either the ability or the inclination to get rid of randomness (It’s similar to the reaction we have about ‘rational drug design’ – does that mean everyone else was irrational before?). The fact of the matter is that chemists and biologists have been well aware of the randomness in biological systems for decades, and in fact one of the reasons we take random approaches (say phenotypic screening or diverse library design) to try to discover new drugs is precisely because we have studied the randomness and discovered it’s not particularly amenable to more rational approaches. In such cases the trial-and-error process which Thiel dislikes is the rational one; just consider the riches unearthed through pseudo-random directed evolution for instance. Sadly Thiel's thinking is not uncommon among technology entrepreneurs and is part of what Derek has called the "Andy Grove fallacy". The Andy Grove fallacy believes that the problem with drug discovery is a lack of technology and computing power; it’s what some people have called “technological solutionism”. But a lack of technology and a lack of basic understanding are two very different things. There is no doubt that we should use all the technology at our disposal to try to make the drug discovery process more rational and amenable to control. But we should also not believe that any particular discipline is going to transform this landscape, especially when we don't even have a good understanding of where its peaks and valleys lie. Just a typical example of smugness emanating from physicists and computer people who understand too little biology. There is never a shortage of them because the fact that the past 50+ years have consistently proven them wrong does not deter most of them. I would not be so harsh. Some of the great discoveries in biology over the past 50 years have come from physicists and mathematicians. The level of rigor in analysis, model building, and hypothesis testing that is second nature in physics is still not a way of life in biology, at least the part that I am exposed to. I see way too many unsuccessful experiments attributed to bad batches of chemicals, way too many graphs purporting to establish trends without error bars (often because replicates and proper controls were never run), and way too many fickle systems where the variability is assumed to be uncontrollable even when it is clear (to a physicist) that there are parameters that need to be controlled but are difficult to do so. The control problems in biology are orders of magnitude more difficult than physics but they are not impossible to tackle. I believe that Andy Grove's "rants" are along the latter lines. The semiconductor industry has spent decades learning about minute things that matter and learning how to control them. The biotech industry has been lazy in this respect because nature is so tolerant of sloppiness - enzymes do their magic even when exposed to variability that would make most physics experiments worthless. There is a lot that biotech can learn in that respect. This cuts both ways. There is plenty of arrogance to go around on both sides of the debate. Those who do end up making an impact outside their field tend to be the humble ones. This common thinking of investors in biotech makes for one sobering conclusion: Only government can invest in basic research completely blindfold, knowing that randomness and accidental discoveries will eventually pay off in the long run. Sadly, government and grant agencies are more and more thinking like venture capital firms wanting to predict discoveries and get a quick return on their investments. There is plenty of evidence that randomness is a good thing and many of our major breakthroughs have been a result of accident. Unfortunately, we are obsessed with quick results and are trapped in a cycle of short term thinking. Well said. I agree that the private sector with its emphasis on the next quarter will always have a bias toward ignoring important randomness and trying to tame that which is best left unfettered and free. However a select few companies like Google might be taking the long view.